It was great to see close to 100 boats in the starting area for the 2015 Vineyard Race. The event has bounced back impressively, thanks to Stamford Yacht Club offering different course and rating options to cater to a broader audience. A very cool mix of yachts took the start on Friday, September 4, from the Andrews 80 Donnybrook all the way down to the Colgate 26 Trouble. Multihulls had a place at the table this year as well, led by the turbo Gunboat 62 Tribe. 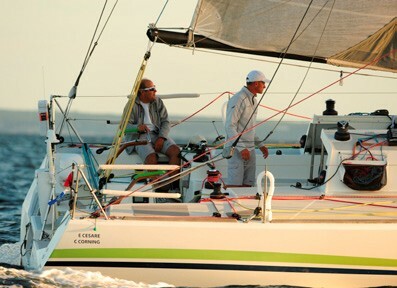 Ed Cesare and I raced again this year double-handed aboard the Class40 Pleaid Racing. The race would not be a cakewalk, as a frontal passage just offshore produced a brisk easterly breeze for the leg out to the Buzzards Bay Tower. This would prove a challenge for many of the teams and there was a notable amount of retirements on Friday night. With true wind speed in the high teens/low 20s, we sailed the first bit of the race with a reefed mainsail and a very open jib. Conditions were not too bad to start as the adverse tide smoothed out the sea state. The party did not last long though, and when the tide turned favorable some fairly nasty seas ensued. The wind was very shifty as we neared the exit of Long Island Sound, which presented some nice tactical options…very fun to hit a few shifts and trade tacks with some faster boats as we exited the Sound through the Race. Once out of the Sound the wind backed into the northeast, which made the leg from the Race to the Tower very port tack-biased. We took our time on starboard across Block Island for some tide relief and smoother seas. With increased backing it turned into a virtual fetch from “1BI,” though we had to take a quick jag close to the tower. We rounded at 0645 in the company of the Santa Cruz 52s Magic and Bombardino, as well as the R/P 44 Miracle. I’m sure everyone was very happy to see the A2s after a long night on the wind. We had a great run all the way to the finish with these three boats, which definitely kept us on our toes. Predictably, after blowing strongly for the upwind portion of the race the wind began to ease, making much of the trip back to the Sound a VMG run. It was interesting to see the exclusion zone at the beginning of the wind farm at Block Island; I’m sure that will be an interesting tactical proposition in the future! Once past Block Island the wind began to gradually turn to the right, which changed our Sound entry point from the Gut to the Race. We had our fingers and toes crossed that the breeze would hold once we got back into the Sound, and amazingly it obliged. The challenge on the final leg lay in the big variations in direction and velocity that had us changing between the A2, A3 and A5 frequently. As is usually the case, we encountered light and variable winds on the short leg in from the Cows to the finish off Stamford. Of course a tug and two gravel barges were inbound at the same time, making things a lot more exciting than they should have been! It was a very rewarding race for Ed and I, and we were very pleased to win our class and place second overall in fleet against the fully crewed boats. As usual, the awards party at Stamford Yacht Club on Sunday night was awesome and capped off an excellent weekend of yachting. Another Vineyard in the books – looking forward to next year! 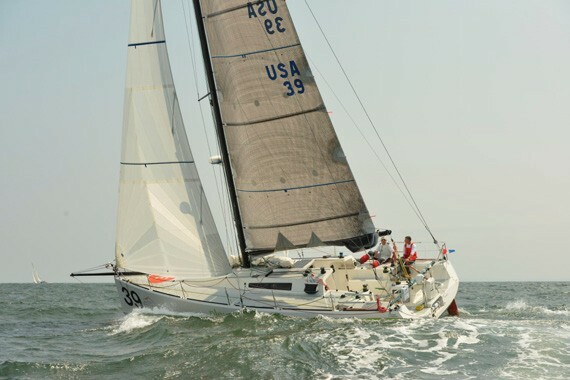 Chad Corning is a professional sailor, program manager, build manager and coach. 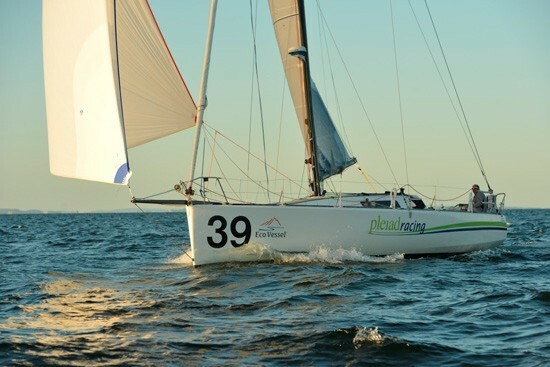 A two-time Melges 32 National Champion, two-time Viper 640 National Champion, Shields National Champion, and Melges 32 European Champion, he is program manager for the 2013 and ‘14 Melges 32 World Champions Team Argo, and co-skipper of Pleiad Racing.